At least five massive bombs hit apartment buildings across Baghdad on Tuesday, killing at least 39 people and wounding more than 130 in the latest sign Iraq's fragile security could dissolve in the chaos of the unresolved election. It was the fourth attack with multiple casualties across Iraq in five days, a spate of violence that has claimed more than 100 lives since Friday. The attacks have spiked as political leaders scramble to secure enough support to form a government after the March 7 parliamentary elections failed to produce a clear winner. Ayad Allawi, whose bloc came out ahead in the vote by two seats over Prime Minister Nouri al-Maliki's, said the political deadlock caused the recent wave of violence, The Associated Press reported. The violence follows attacks on April 3, which targeted the Iranian embassy and the German ambassador’s residence in Baghdad killing 30 people and wounded 200 others. It comes as Iraqi political parties hold talks on forming a new government after the March 7 elections that failed to produce a clear winner. Al-Qaeda-linked terrorists carried out the attacks today in a bid to undermine security and disrupt the political process, Major General Qassem al-Moussawi Atta, spokesman for the Baghdad Military Command, told al-Iraqiya in a telephone interview. "We are in a state of war with the remnants of al-Qaeda," he said, according to Businessweek. Qassim Atta, a spokesman for Baghdad’s security apparatus, told Iraq state television on Tuesday that the violence represented a war in which insurgents are seeking to destabilize Iraq amid its post-election confusion. 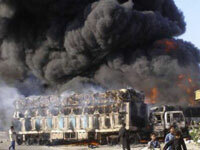 “We are in a state of war with what remains of Al Qaeda,” he said, The New York Times informed.